The purpose of Martin Luther High School is to provide the spiritual atmosphere necessary to enable the students to obtain quality education and to grow in their faith in Jesus Christ as their personal Savior. 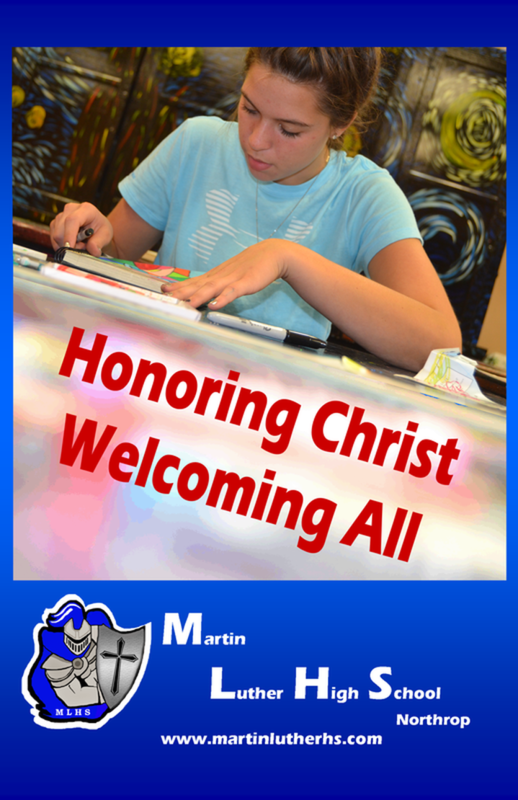 Martin Luther High School will strive to continue the Christian guidance and values which have been instilled in these young people through Christian homes, families, and the church. In order to realize this purpose, the following objectives have been developed. A. Grow to the fullness of their God-given abilities. B. Develop respect for themselves as individuals and to respect and use their God-given talents and rights. C. Learn to accept others as individuals and to respect others’ talents and rights. D. Learn to express their Christian faith in all thoughts, words, and actions. E. Learn to develop and exercise respect for all forms of authority: God, parents, and all others who are placed in authority over them. F. Relate responsibility to God’s creation, specifically in rural America, by acquiring knowledge and understanding of, and developing talents and skills for responsible living and serving. G. Acquire academic proficiency in a variety of subjects which will prepare them for college and for service throughout their life. H. Grow in their prayer life. I. Grow in their knowledge of the Holy Scriptures. J. Learn to witness from their teachers’ witness. K. Cooperate in maintaining classroom settings of love, joy, concern, and respect. L. Provide support and give social, academic, and spiritual encouragement to all members of the Martin Luther High School family. M. Recognize the importance of service to others and the positive impact it has on themselves and the world around them.